The following picture may clarify the odd orbit shown above . In this frame the orbit is shown from "above " . Earth is the little dot at 11 'o clock in this rotating frame around earth . In this view it is clear that the asteroid is in resonance to earth . In fact the resonance is exactly 1:1.75 , meaning the asteroid takes his position again after 8 years . ( look how beautiful the orbit matches the previous orbit after 8 years) . The odd orbit above is created while the asteroid 1998WZ6 has a rather big inclination of 24° and a rather big excentricity of 0.4 . The recently discovered asteroid 2007RF1 ( not very much more than a big rock ) must have made a close flyby at Venus on July 14th 1970 (any French compatriots here ?) and gained enough energy to augment its SMA. Heres a simulation of the path of the asteroid ( data taken from NEA - site ) , simulation goes back in time . First part shows the path ( in green ) from above . At a given moment 2007RJ1 meets Venus at about 8 'o clock and changes its orbit outwards . The second part shows the path in rotating frame around Venus . Venus is here the pink dot at 3 o clock . This sim starts as the asteroid approaches Venus from the outside and comes really really close . According to the Ephemerides it must have been 0.0008 AU away from Venus. In the following screenshots the orbit of the asteroid 2003FY6 is shown in 3 rotating frames , first around Earth , then Venus and last around Mercury . The first picture shows the orbit as can be seen in the jpl NEA site . The three frames were generated as the asteroid crosses the orbit of the three planets mentioned above. It's remarkable how in each case the orbit has a different aspect . The following sim gives an idea about the influence of Jupiter on the recently discovered asteroid 2007RR9. The ast is rather big ( mag about 20 ) . It' not really a tread to Earth according to the calculations available now . 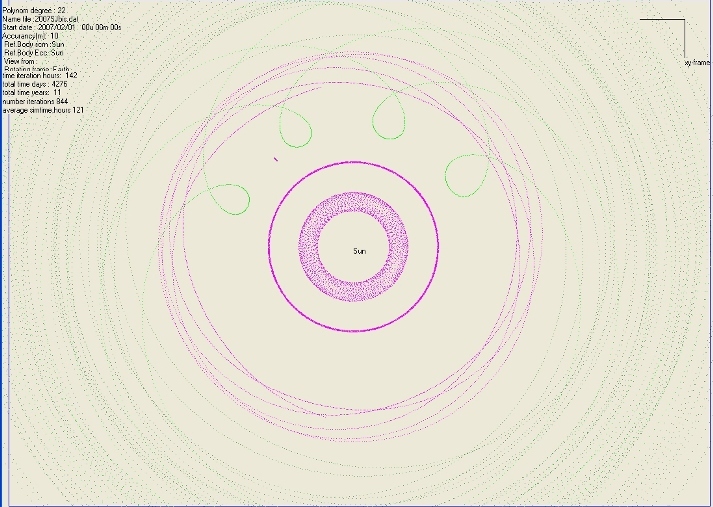 third : the orbit in a rotating frame to Jupiter as simulated for about 80 years (one frame per year) . The initial frames show the data of the asteroid from the NEA site and the NEODSYS site . The asteroid came close to Jupiter in 1982 and will be close again in 2042 an 2054 . Now the asteroid crosses the orbit of the Earth . Before the pass in 1982 it was outside the Earth's orbit . After the next encounter with Jupiter it will again not cross the orbit of Earth anymore ( but will stay "outside"). The results are preliminary as they are calculated on merely 2 days of observation . On 2017/01/24.91250 57777.9 it will come as close as 0.0213234 AU from Earth (data from Neodsys). Unlike other asteroids this one was detected when it was still very far from earth ie. more than 0.1 AU ( most of them are detected when they will come close within a few days , or even have passed Earth ) . Hereunder a screenshot of its close pass to Earth in 2017. The red circle represents the orbit of the moon . The asteroid has been observed for one day more and the tread to Earth seems to be gone according to the new ephemerides . Instead of coming closer the next years ,it is now moving away from earth . Curiuos about his past I created the following rotating frame back in time ...for 50 years . The asteroid starts at 2 'o clock and moves towards Earth , but after 30 years it seemed to "hold" . I never saw this behaviour before . This asteroid is yet second on the hazard scale of NEA. First is Apophis . Maybe tomorrow the situation may have changed again after additional observations . Yeah . The movement is rather exceptional in this case : where the ast moves close in the past and reverses , in the future it moves away from Earth and comes very close after 200 years ( at the opposite site ) , then reverses . But when coming close after 400 years it gains speed and overshoots and crosses the Earth . I made some screenshots . That's what I found too. So this one is not in a stable resonance. But after they better refine the orbit, that may change. The speed at which it progresses is not constant. I deleted Jupiter from the simulation to verify that Jupiter was the cause of this. It was. This asteroid 2007SJ may be one to watch ... , as it is very big . The current rating in the Palermo scale is bigger than that of Apophis. As the position and velocity of the asteroid is still not very certain and to get any feeling what this uncertainty implies I simulated the orbit of 2007SJ together with 6 close orbits , each at a distance of 300.000 km of the asteroid in the x+-,y+- and z+- direction. This corresponds roughly with the distance Earth- Moon . This also means a deviation of its current position of 10-4 ! . I think the uncertainty now is much bigger . The sim hereunder covers almost 40 years from now . New observations are available for 2007SJ ; one day of observation was added ; it's period is now estimated to be 2.87 years. 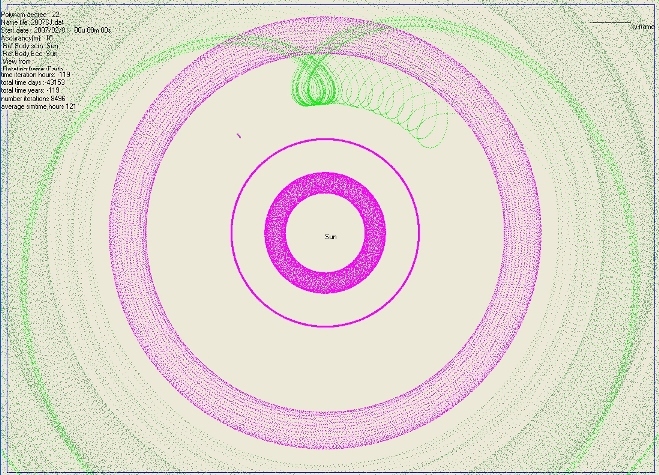 Herunder is a simulation in which two orbits are shown : the orbit as predicted yesterday in drak green and the orbit with the parameters of today in light green. Both bodies were given "zero" mass . The asteroid comes much more closer to earth in 2014 than estimated before. One more day of observation for 2007SJ still keeps it to be the most serious threat . On 24/09/07 the period was computed to be 2.85 years . Hereunder the orbit of the asteroid ( in light green) . The dark green orbit is the orbit as prognosed two days ago .